Winners of She Hacks 2014! I was also amazed at the generous catering – pizza, caffeine, snacks, lots of cookies made by team mate Denise, and a decidedly un-male breakfast spread of yoghurt, muesli and fresh-cut fruit! HOWEVER… our team of Denise Fernandez, Luciana Carrolo, Kim Chatterjee, Anna Zaitsev and myself won first prize with our “Mission Possible” app!! The site is designed to connect volunteers with coordinators to assist with disaster relief. The amazing prezi designed by Anna and Kim describes the idea in detail. 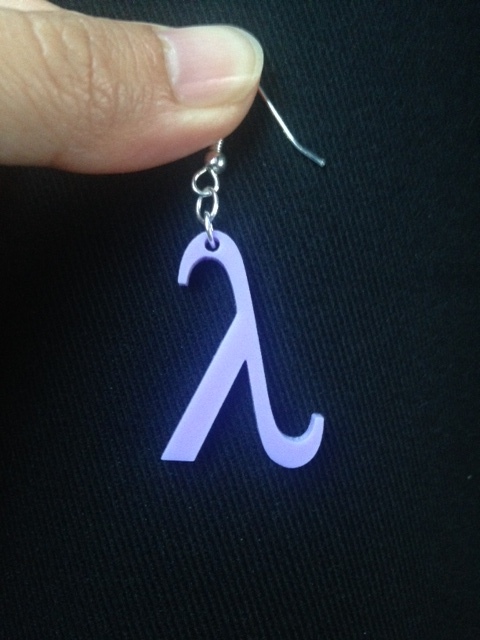 The source code is available on GitHub. The app was designed to be realtime so that volunteers can see up-to-the-minute information about where their help is needed, and in our demo we used two screens to great effect (realtime updates are always a crowd pleaser!). It was written using node, socket.io, handlebars, google maps, twitter bootstrap and a lovely set of custom icons designed by Kim. 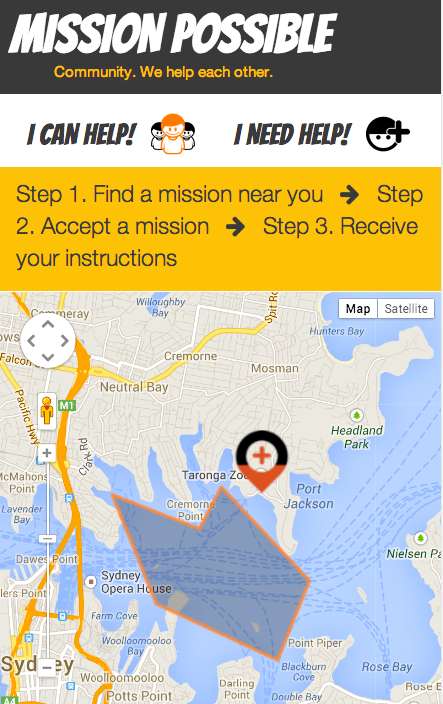 A screenshot from our app shows a shaded area where the “disaster” has occurred (an oil spill), and a point which is the muster point for volunteers to go to to help (save the penguins!). Everything updated in real time from a master coordinator, who would add extra muster points and specify numbers of volunteers that should be at each point. 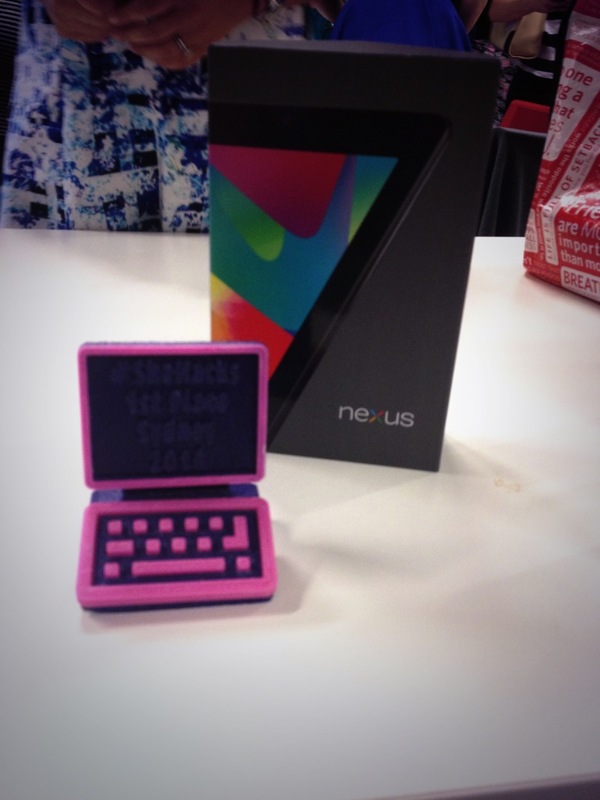 Our prize was a Nexus 7 tablet and a 3D printed trophy, which was a pink computer. I was pretty happy with the outcome of that! It’s the third hackathon in a year that I’ve participated in and won prizes for. I really love the energy and creativity that comes out of such an intense situation, and it’s a lot of fun to see what everyone else does in such a short time as well. 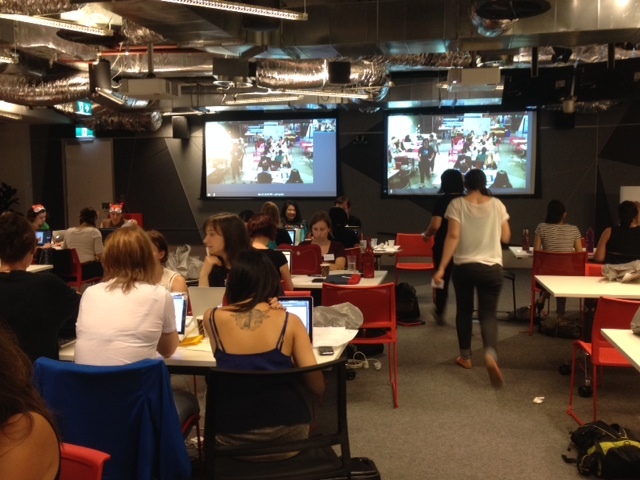 Thanks very much to Girl Geek Sydney for a great event! 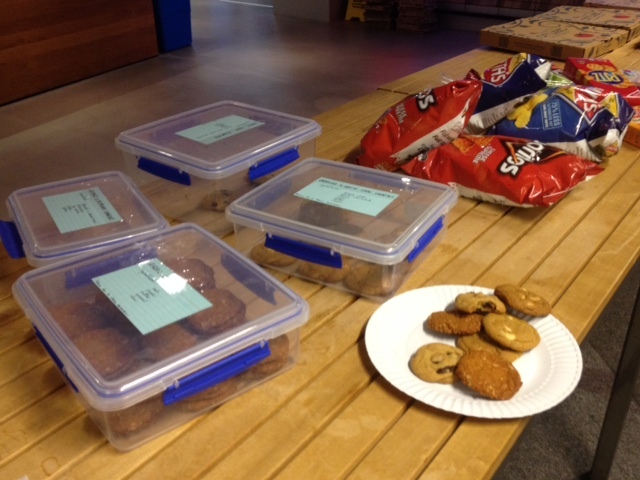 This post originally appeared on the 7digital developer blog on 15th February 2011. It has been moved here for preservation. A few weeks ago, we launched the shiny, redesigned new 7digital.com to a beta audience. Unfortunately, we had a memory leak. The new site was hosted on the same set of hardware as a few other applications, and it was gradually bringing the other sites down. We put a limit on the amount of virtual memory to shield the other sites from the memory leak, but performance kept deteriorating. Thankfully, the memory leak was eventually found – here’s a set of steps I followed to find it. Graham, a fellow dev, helpfully pointed out userdump and also gave me a crash course in windbg. Userdump is a command line tool which will take a snapshot of the memory space used by a process. It’s important to note that it freezes your process while it takes the dump, so if you’re doing this in live, your site might stop for a minute or more. You can use the inbuilt iisapp.vbs script on the command line to find out exactly which w3wp process belongs to which Application Pool, and therefore which process to dump. Once you have the process id, take the memory dump and examine it with windbg. Two useful articles were Getting Started with windbg by JohanS, and Tess Ferrandez’s excellent lab/tutorial on how to navigate through a memory dump. Since the live dump didn’t highlight any obvious problems (it only had information for a minute or less of runtime before the app pool recycled), we added some performance counters to see if we could find any trends. You can access perfmon under Start > Administrative Tools > Performance. MSDN has a good explanation of the different counters and what they mean. Since we were concentrating on memory, I added the following counters and waited for any trends to appear. Edit: It’s possible to show counters for a single process, but if you have multiple w3wp processes running on the same box (as we do), it’s difficult to get the counters for the right one. I was looking at counters for the whole box, which didn’t give me a lot of detail. A live memory dump is all well and good, but it just looks like a screen full of hex 🙂 Local profiling gives you some lovely graphs, stack traces, statistics on running time, etc which you can use to drill down into specific methods or lines of code. If you know what user action is causing the leak (e.g. clicking the “Purchase” button), you can profile that on your local machine and easily identify which method or line of code is causing the problem. I downloaded ANTS Memory Profiler, DotTrace, and AQTime to try some local profiling. The learning curve on ANTS seemed to be the gentlest, although if you are familiar with any of the tools, it would help greatly. The ANTS inline help files were an excellent refresher course on how .NET garbage collection works. I spent about a day learning how ANTS works, and doing some common page loads on my local machine. I didn’t see anything unusual. But…. my mistake was to profile without load. It’s very difficult to spot trends unless the changes being made by an action are exaggerated. ApacheBench was recommended, which is a command line tool for benchmarking performance, but also handy for making lots of concurrent requests. So I lined up multiple requests (and executed them multiple times, all while running ANTS) for common pages in our site, like the search page, artist page and album page. Nothing really turned up until I tried to add products to a basket – and got my breakthrough. Here are the two graphs of memory usage from ANTS. The first shows code behaving itself and being cleaned up by the garbage collector when some normal actions were load tested. The second illustrates our memory leak – the line in green highlights the total memory (managed + unmanaged) being used by our process, the line in red is the amount of managed memory allocated by .NET. Unforunately, this meant that our leak was in unmanaged memory, which ANTS couldn’t help me track down. This was the reason that the memory kept increasing. Some piece of code was dynamically loading assemblies, and once there, they never get unloaded. However, it’s very difficult to get any more information about them in windbg for framework version 2.0. Windbg for v2.0 has less commands than windbg for v1.1 (strange! ), and the internet seems to be full of demos using windbg 1.1 showing more information than you get now. They are a good starting point, but be aware you won’t be able to follow them 100%. Tess Ferrandez again has a great tutorial on chasing down unmanaged memory leaks if dynamic assemblies aren’t your problem. The Modules window in Visual Studio shows you which assemblies have been loaded, and it gives you more information than windbg (the name of the assembly, at least) so it was just a matter of repeating the step that caused the error with the debugger attached, and watching when the number of assemblies changed. The culprit was finally found – it was the Application_Error event handler. We were mis-using a piece of 3rd party code which was creating dynamic assemblies every time an error occurred. And unfortunately for us, it was a catch-22 because our beta users were finding errors we’d missed in testing, making the leak worse. This post originally appeared on the 7digital developer blog on 8th June 2011. It has been moved here for preservation. 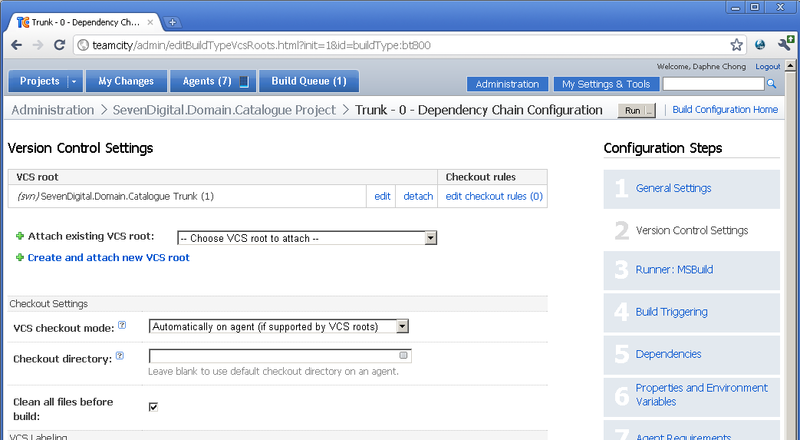 You can also use a newer TeamCity feature called Snapshot Dependencies for a cleaner way of managing dependent builds. We have recently switched to using TeamCity to manage the building and updating of our shared code at 7digital, which is great. The process is fast, completely automated and configurable, which is a vast improvement over our old build process – very manual, error prone and could take up to 3 hours of a developer’s time. All consumers should update their references as soon as possible to catch any bugs. 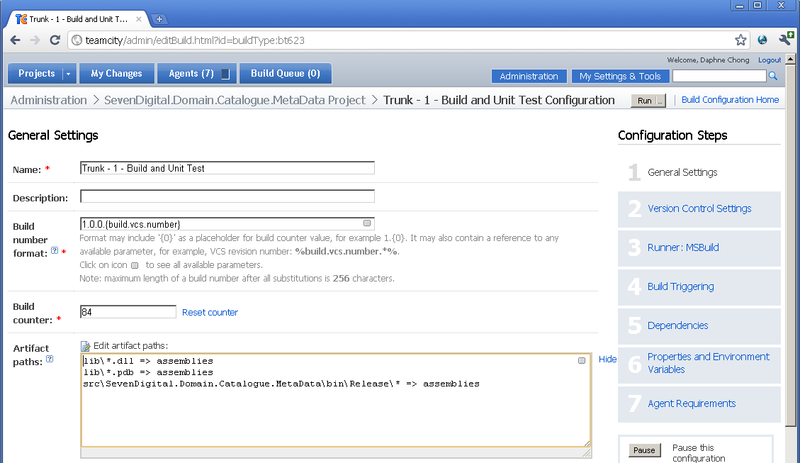 Here is how we do it using TeamCity and a set of project conventions. Each solution has multiple projects, and a lib folder which contains third party and in-house domain dlls used by the projects in that solution. By convention, the lib folder sits in the top level folder. Projects create references to the dlls straight from this location. Updating a dll in the lib means that all projects will use the new version immediately. This is really handy for upgrading all projects to a new version of a third party tool like NUnit, RhinoMocks or StructureMap, but it also works for our own in-house dlls. All we need is an automated way of updating the dll in the lib folders to the latest version whenever someone commits a change. Enter TeamCity! We’ve placed the set of in-house domain projects in a linear build order. 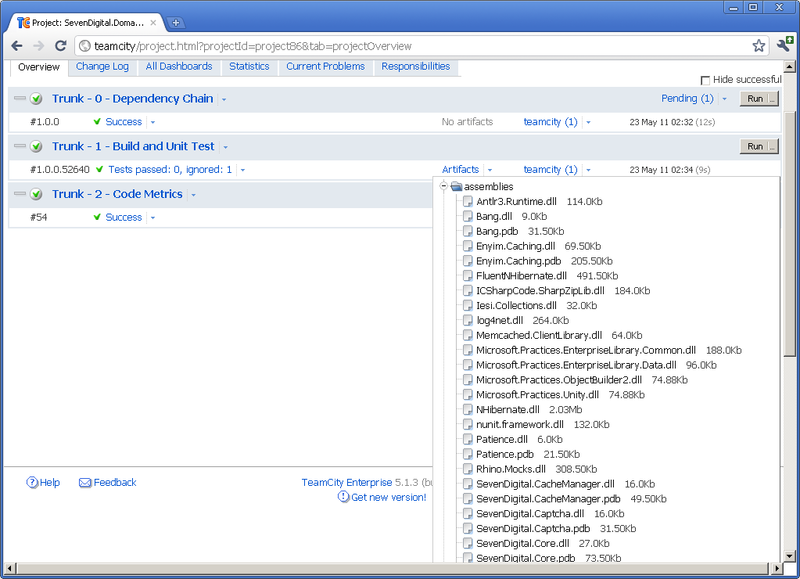 Each project in the list is configured to trigger the next in line when it successfully builds, using the TeamCity “Dependencies” tab. If somone makes a change to a domain project, TeamCity will pick up the commit, build the project and run its tests, and this will kick off the rest of the chain underneath. In the screenshot examples below, I’ve used a portion of our domain chain where SevenDigital.Domain.Catalogue is dependent on SevenDigital.Domain.Catalogue.MetaData. We split each project into two (or more) builds in TeamCity, which are run in order if the previous build succeeds. 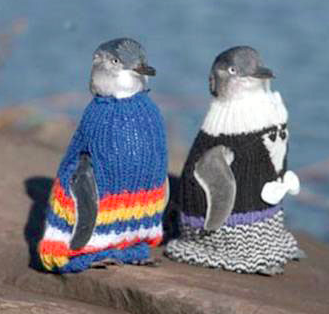 0) Dependency 1) Build and Unit Test 2+) Integration Tests (if they exist), code metrics, etc. The (1) Build and Unit Test is a normal build triggered by developer check in, which builds the solution and runs unit tests. On each successful run, it will export the assemblies from its lib folder and \bin\debug folder to artifacts, using TeamCity artifact paths. 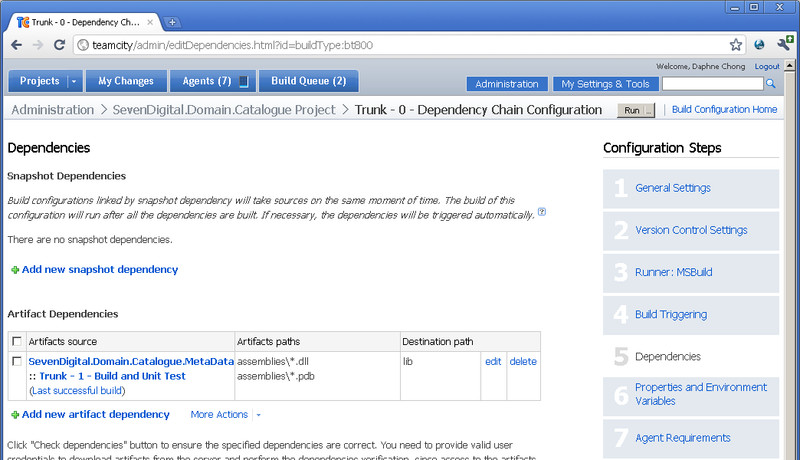 The assemblies are then accessible by other TeamCity builds, and used by the (0) Dependency Build. The (0) Dependency Build is always triggered by a previous build in the chain. It is responsible for updating the project lib folder with the latest versions of the previous build’s dlls, which sounds a bit complicated, but is easily broken into steps. We use the build agent like an automated developer – it checks out the project source code to a local folder, pulls down the artifact dlls from the previous build to the local lib folder, and then does a command line commit to either git or svn depending on where that project is hosted. On the “Version Control Settings”, we always set the VCS checkout mode to “Automatically on agent”. This means the source code goes to the build agent machine rather than on the central server. On the “Dependencies” tab, we add an Artifact Dependency to the previous Build & Unit Test in the chain, taking all of the published dlls. The destination path is set to “lib”, meaning the agent takes care of downloading the dlls into the local lib folder, effectively overwriting them (or adding new ones in to the folder if they don’t already exist). From a version control point of view, the lib folder now looks like it has updated files that are ready for checkin. We use an msbuild or rake task that executes a command line commit from the root folder. The agent already has a link back to the main repository, because we checked the code out directly to the agent. (svn|git) commit -m "Auto Commit from $(agent_name) for build no $(build_number)"
The commit from the agent is just like a regular checkin. 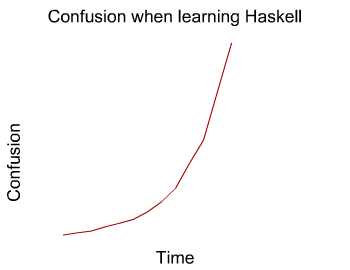 It triggers (1) Build & Unit Test, and the cycle continues down the chain. Setting up the entire chain took a large amount of configuration, but it’s been worth it. The biggest gain has been removing the manual component of the build, which means we get faster feedback if something is broken, and people are able to make changes more confidently.